Home / Tails from the Trail / Synopsis of Weekend Intensive with Wendy Murdoch, by Bob W.
Synopsis of Weekend Intensive with Wendy Murdoch, by Bob W.
“If I had to choose one word to describe my private intensive with Wendy, it would be “enlightening”. Wendy sets the stage for learning by creating a non-judgmental ambiance. She wants to seek answers by discovering why we do what we do. 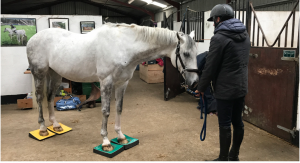 Without critiquing our preferred means of movement whether that be aiding the horse, sitting in the saddle or posting a trot, she helps us discover other ways of using our body to achieve the same end. In this way we become more aware of ourselves and how we interact with the horse. The human was not the only one who gets to discover themselves, she works with the horse as well. My horse had a balance issue that determined her way of moving. All of the tools and methods that had used and been taught throughout the years to address this means of moving were just window dressing because they had never change the mares balance. Wendy addressed her nacent problem using in-hand techniques then with riding aides. The outcome was truly unbelievable. Not only did the horse benefit, but it helped me discover what she should feel like when she is correctly using herself. My wife’s horse was agitated by the surroundings, he had never seen a house cat before to my knowledge. 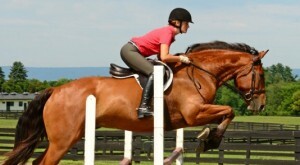 In addition he suffered from problems learning to balance with a rider. Wendy addressed both issues by actually stressing his awareness of balance by getting him to stand on foam blocks. I remained awed at the difference this exercise made in this horses confidence and made him a much more secure mount for my wife. I use the round pen to join-up with horses before getting them under saddle but I saw this horse join-up with Wendy somehow just by her working with him. This still amazes me to see how he found her a safe place to be when he became stressed by the new surroundings. She then worked with my wife and I to transfer this “safe place to be” to us. The exercise on the blocks has to be the miracle of the intensive. My work with Wendy that weekend taught me the importance of balance. 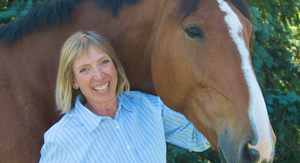 I developed a better feel for balance and it helped me with tools I have learned to help my horses with their balance. I intellectually understood about balance, but this work help me better experience it and see firsthand how it affects the horse’s confidence, demeanor and way of going. Wendy has the unique ability to meld science and understanding with action and feel in her instruction. So, Wendy is able to satisfy those of us that like to know why we do something to better understand the “how”. We started breeding Percheron crosses years ago for the fox hunting enthusiast but along the way our interested shifted to dressage. Our mares are retired now and we are changing the breeding program although we have one Percheron cross filly that is bred for second generation cross something that is preferred by the eventers.